I am in a Halloween state of mind. After all besides it being my "littles" first Halloween, and they live here, AND it is a great chance to scare the H-E-double hockey sticks ouf of my sisters, it is also my anniversary. I will have been married to my angel for 11 years this year. Or wait, is it 12 years? No, I think it is 12. Anyway, we love celebrating all things Halloween, nothing to hideous or horrid, just fun. 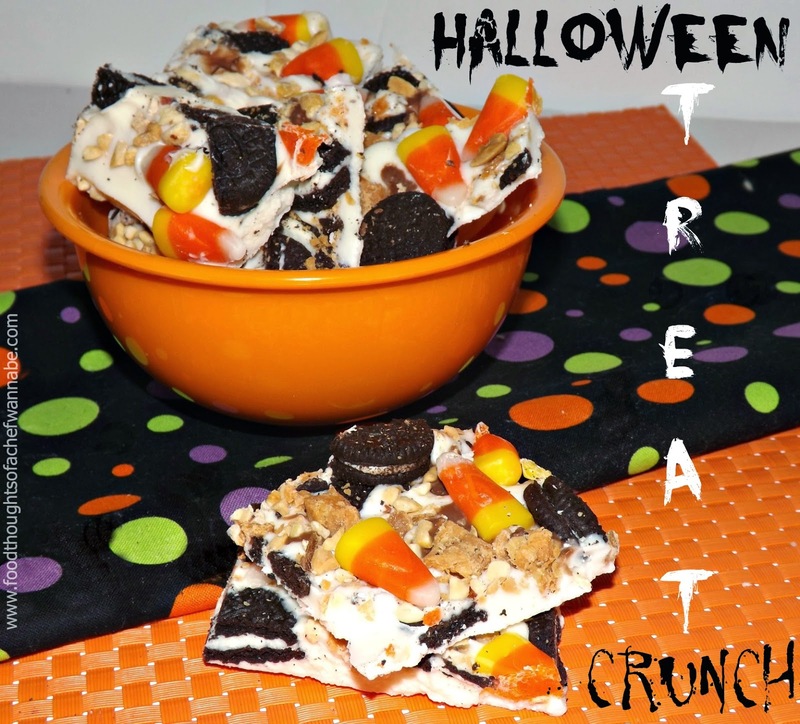 This will be an easy treat for a Halloween party, or that last minute, "Mom I need to take something to so and so" and you need to be there in 30 minutes. Use whatever you have on hand and call it a success!! I used items I find typical of Halloween or in Halloween colors but the world is your sandwich, make it how YOU like it. It is an easy, no bake. Wait. You DO have turn on the oven, and let your chocolate melt but.......even that you COULD do in the micro and then spread on parchment paper on a cookie sheet. So technically...........oh Lordy, nevermind. 1 cup mini oreos or 10 large oreos. Roughly chopped and a few left whole. Now let it sit for 30-45 minutes on the counter or about 10-15 in the fridge. Break it up or cut it up, just get it in your belly!